St. Catherine's Parkland...a diverse landscape mosaic. Big Yellow Taxi, written and sung by Joni Mitchell, was released in 1970. It was a song expressing grave concerns for the environment. The chorus goes, "Don't it always seem to go that you don't know what you've got 'til it's gone….."
It is estimated that ninety seven percent of our wildflower meadows have been lost in just the last seventy years. With its wildflower rich grassland, open grown mature trees, and wetland, the parkland at St. Catherine's is a rare glimpse of what was once commonplace. oak. It will in time take its place. Parkland consists of open grown trees. A limited number of cattle grazing the parkland at St. Catherine's is key to maintaining such a diversity of species. Credit must be given to the National Trust tenant farmer for his conscientious management of this land which is under an HLS scheme. Cattle do not graze vegetation as close down to the ground as sheep. Unlike sheep, cattle use their tongues to pull tufts of vegetation into their mouths. This often leaves tussocks which benefit insects and small mammals. As they have such wide mouths, cattle do not overgraze or target certain species of plants. This results in a highly diverse habitat. Cattle are excellent at keeping back some of the rank vegetation. In areas where they have broken up the ground, seeds are more easily able to germinate. Here an oak tree seedling is a possible veteran of the future! Bumblebee on Betony, St. Catherine's. The wildflowers here offer a sustained source of pollen and nectar for the bees during the long Summer months. Many acres of perennial rye grass have taken the place of the wildflower meadows. This has had a devastating impact on bumblebee numbers. At least two bumblebee species are thought to have become extinct recently with others such as the Great yellow bumblebee and the Shrill carder bee on the brink. David Attenborough once said,"Bumblebees are key factors in our wildlife. If they disappear many of our plants will not bear fruit." A bumblebee is covered in pollen on a Cat's Ear flower at St. Catherine's in late July. Bees are needed to pollinate plants BUT plants are needed for bees to pollinate! The presence of Quaking Grass is an indicator that unimproved native grassland is being well managed; it is good to see it at St. Catherine's. A grass roots level view of Harebells, Betony, and Meadowsweet. Dead wood is left to rot within the parkland. it is a valuable habitat for many invertebrates, some very rare. Here a fallen tree is surrounded by Birdsfoot Trefoil, Black Knapweed and thistles. Foxgloves with mature parkland trees and younger trees in tree pens in the background. Just some of the many species of wildflowers to be seen in the parkland at St. Catherine's in July. Now...any idea what this one is!? In the wetland area is a stand of "nationally scarce" Touch-Me-Not Balsam which the rare netted Carpet Moth depends upon for its survival; the UK Biodiversity Action Plan classes the moth as a priority species. It is listed as vulnerable in the Red Data Book. The Touch-Me-Not is growing up against the dry stone wall in the south west corner of the parkland. 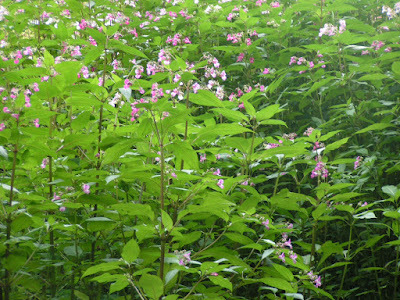 Invasive non-native Himalayan Balsam is eradicated every year from this area to stop it encroaching, and ultimately displacing the Touch-Me-Not. Hopefully this post has given some indication of the rich biodiversity that is contained within this small area of parkland called St. Catherine's! Dora's Field. Invasive Control Work. A concerted effort has recently been made to rid Dora's Field of invasive plants, namely Japanese Knotweed and Himalayan Balsam. Countryside Rangers from St. Catherine's and High Close with help from volunteers and a work experience student combined forces to deal with this problem. 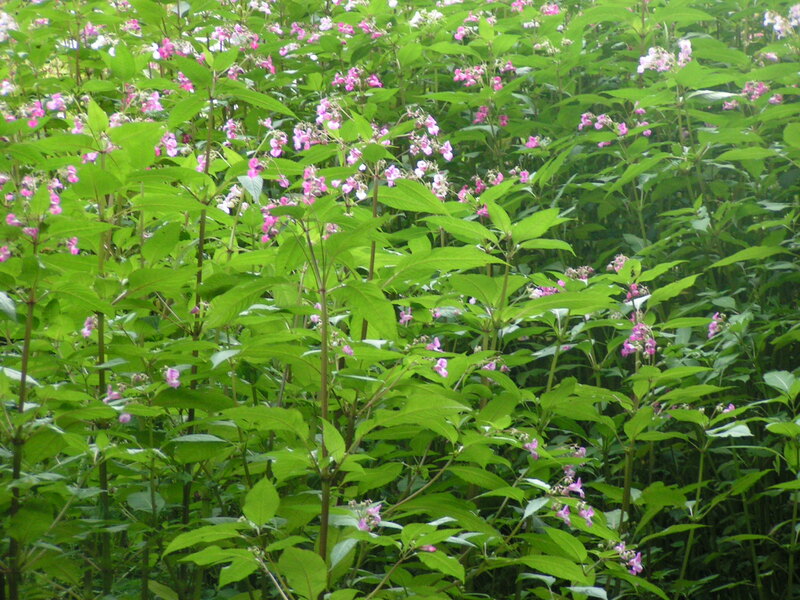 ...as indeed have stands of Himalayan Balsam in Dora's Field. Work experience student, Luke with arms full of Himalayan Balsam heading for the fire site. Academy Ranger, Pete with volunteer, Sue dragging down a bulk bag full of Himalayan Balsam. Laura is in the background dealing with the Knotweed. Volunteer Coordinator, Greg, who volunteers to do this role, is about to bag up some knotweed ready to be burnt on site. ... an application of Glyphosphate; it travels down the hollow stems to the rhizomes (sprouting root system) with devastating results. It is a time consuming process but highly effective in eradicating this pernicious weed. Cutting back the stems will also help to exhaust the rhizomes but it may take several seasons to accomplish! ...and 'tidy up' with the leaf blower. To sum up, a difficult task was made manageable through good team work. Tree Bumblebees at St. Catherine's, Windermere. BEEneficial Invaders? 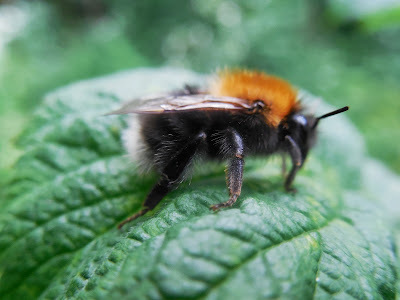 Tree bumblebees (Bombus hypnorum), originate from Europe and were first recorded in the UK (New Forest area) in July 2001; they were probably blown across the English Channel. Since then they have spread rapidly with colonies now spotted north of Carlisle. They are tricoloured.. ginger thorax..black abdomen..white tail. As their name suggests they nest in holes in trees, but bird boxes appear to be their favourite places to set up home; a bird box has been taken over at St Catherine's. Male tree bees are flying around the bird box waiting for the new queens to emerge. Male bees have no stings. They are harmless. A closer look at four of the males vying for pole position. There are many more males than queens so competition is intense. The worker bees can occasionally become aggressive if they perceive a threat to the nest. I got too close for their comfort and was stung! Bumblebees do not have barbed stings unlike honey bees. They are more like wasps and live to sting another day. Two years ago tree bees took up residence under the eaves of the staff toilet at St. Catherine's. These toilets were put out of use for a while as the doors opening and closing really irritated the bees and they made it obvious! Image © Ben Knipe. The markings are clear in this image. The entire colony dies out after a few months except for the new queens. They hibernate in Autumn and emerge to start new colonies in Spring. A worker tree bee with full 'pollen baskets' heading for the nest under the eaves. © Ben Knipe. Tree bees are generally perceived as natural invaders. (Not introduced by humans). Most experts consider them as valuable additional pollinators and do not think they are a threat to the long established bumblebees in the UK. Tree bees exist alongside several species of bumblebees on the continent that are also found in the British Isles. After many months in the making and years in the planning, the Aira Force Steamer pier is now up and running. It is the first new stopping point to be built on Ullswater for 50 years. There has also been a huge improvement to the access from Aira Force down to Aira Green with a new hard standing path and boardwalk. With the complexity of drilling into the lake bed, the pier took a number of months to complete. The finished article fits effortlessly into the surrounding landscape. The new boardwalk navigates people from the hard standing path, to the end of the jetty. The boardwalk allows easy access across a previously boggy and overgrown section of land. The pier is the final piece in the jigsaw, to the visitor offer now available at Aira Force. Tourists and locals can now catch a steamer from Glenridding to Aira Force, where they can drop into our new Welcome Building and pick up one of our waterproof Ranger guides, before heading off to explore the majestic landscape of Aira Force. Once they have exhausted the numerous pathways, the tearoom is a perfect place to rewind and regain some energy for the walk back along the rolling pathway that skirts along the lake shore back to Glenridding. As of the 1st of July the steamers are now running every day, so be sure to come along and experience a fabulous day out in Ullswater.